US angler Li started the day at Palm Tree Lagoon by casting out two large balls of groundbait on the carp rods. The third rod was fished with a large mackerel section mounted on the hook. The first take came an hour or so later with a decent Redtail Catfish quickly netted after a lively scrap. After another hour or so the carp rod fished towards the centre of the lake burst into life as line poured from the spool of the reel. Winding down into the unseen carp caused the carp to change direction zig zagging its way across the lake. Further side strain applied with the rod soon had the carp moving again this time towards the angler. Winding down on the carp soon had it chugging up and down the margins causing great plumes of bubbles to hit the surface. After a few more runs the carp began to wallow on the top just out of netting range. The guide quickly took to the water and scooped the carp into the net. 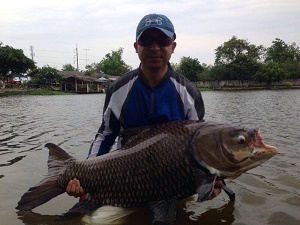 The Giant Siamese Carp was estimated to weigh 35kg’s and was proudly held aloft for photography. The days carp fishing at Palm Tree passed quickly seeing the angler land several smaller Rohu and another few catfish on the predator rod.